Celebrate the holiday season in a whole new way at Audubon Butterfly Garden and Insectarium. 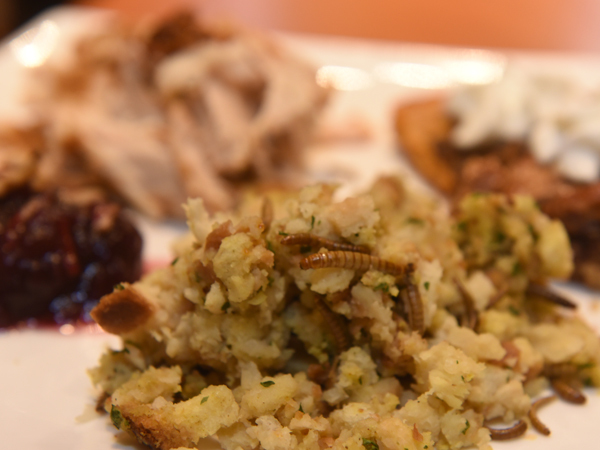 Audubon Bug Chefs stir things up in Bug Appétit by offering visitors the opportunity to taste new twists to traditional Thanksgiving family recipes. Visitors expand their gastronomic horizons by enjoying traditional dishes with a particularly exotic flair, which in previous years have included turkey with cornbread and mealworm muffins, waxworm cranberry sauce and cricket pumpkin pie. Bug Appétit is located at the end of the main hallway of Audubon Butterfly Garden and Insectarium. It offers visitors a chance to taste insect cuisine in many forms – from chocolate “chirp” cookies to six-legged salsa. Look for the buggy Thanksgiving dishes from 10am to 4:00pm at Audubon Butterfly Garden and Insectarium, 423 Canal Street in New Orleans. The tastings are included with regular Butterfly Garden and Insectarium admission while supplies last. Audubon Butterfly Garden and Insectarium will be closed Thanksgiving Day.